In two weeks, the government of Jair Bolsonaro will begin working, and although it is still not entirely clear what the country’s future will look like under the new government, some of the Bolsonaro team’s policies have already been clearly defined. One such issue is relations with the United States and China. It is well-known that the future president seeks to bring the country closer to the United States at the expense of relations with Brazil’s main trading partner, China. But will that be good for the country? In an interview with Sputnik, Brazilian political scientist Maurício Santoro, professor and expert in international relations at the Rio de Janeiro State University (UERJ), has noted a clear desire by Bolsonaro to strengthen relations with Donald Trump. However, sooner or later the Brazilian government will have to recognize reality. According to the expert, Washington has already shown that it does not see Latin America as a priority, and this will have a direct impact on relations with Brazil during the Bolsonaro presidency. 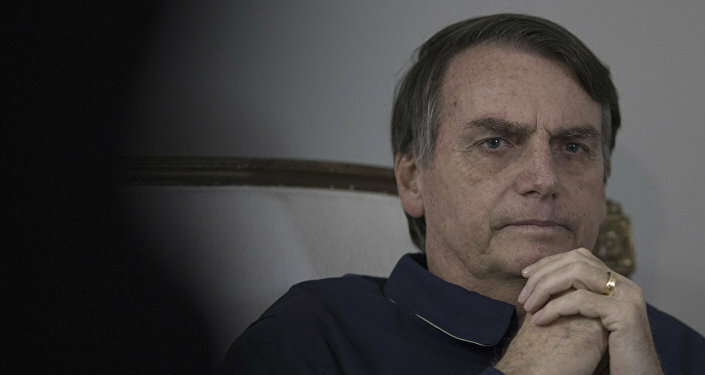 “It seems to me that this desire by the Bolsonaro government to establish priority relations with the United States will face a problem on the part of the Trump government, which will need Brazil only to resolve its regional issues, such as Venezuela and nothing more than that”, he said. “Trump has shown no interest in creating meaningful alliances in Latin America and, despite the Bolsonaro government’s effort, his position is unlikely to change”, Santoro stressed. In late November, Trump's national security adviser, John Bolton, visited Jair Bolsonaro at his home in Rio de Janeiro. This was the first direct contact of the elected president with a senior US official. São Paulo Federal Deputy Eduardo Bolsonaro, the son of the Brazilian president-elect, has visited the United States and made clear that Brazil aims at a complete rapprochement with Washington, without mentioning what Brazil hopes to receive in return. One such example is the parliamentarian’s statement about the transfer of the Brazilian embassy from Tel Aviv to Jerusalem as a resolved matter. Even Eduardo’s Father, Jair Bolsonaro has expressed various positions on this issue over the past few months. Such contradictions directly affect China, which is Brazil’s main trade partner. The statements by Bolsonaro and his allies during the election campaign sounded quite hostile, although the future president received representatives from China after winning the election. According to the expert, who recently visited China and met with local authorities and businessmen, the trend is that reality dictates a different picture. “Accordingly, there is a conflict in the government itself. There are militaries who are quite hostile toward Beijing and see China through the prism of the Cold War, which is associated with the rejection of the Chinese government’s communism, and there is also a liberal wing, which, in my opinion, is still unclear what position it will take. They may take a course towards liberalisation of the economy and trade enough to accept Chinese investment in Brazil. Brazilian entrepreneurs are also divided: there are those who favour Chinese investment because they believe that this is the best way for Brazil to quickly overcome this period with very low rates of infrastructure investment, which characterises 21st century Brazil”, the expert explained. Citing the example of an ambitious privatisation programme, which is a priority for future Minister of Economy Paulo Guedes, the professor noted that such a scenario without Chinese participation does not look plausible and it is clear that these investments will not come from the United States. “If the government really decides to privatise Eletrobras, the potential buyer may be a Chinese state corporation. Because, after Eletrobras itself, the State Grid Corporation of China is the main investor in Brazil’s electricity”, the expert explained. For its part, Beijing has already appealed to the president-elect of Brazil. Beginning with statements of friendship and significance of bilateral relations, then sending representatives and inviting parliamentarians to meet with the Chinese Communist Party in Beijing (with all costs being paid), and ending with warnings in Chinese newspapers about the dangers of a row with China. “Even in its heyday, Brazil invested little in infrastructure and this will obviously continue in the upcoming years with tax adjustment measures and austerity policies. So, if these investments do not come from China, they may not come at all”, Santoro concluded. Views and opinions expressed in this article are those of Maurício Santoro and do not necessarily reflect those of Sputnik.